Please help with our dog...he needs a name and we need help still to cover his bill...go to our paypal at www.huskyhaven.org and help..thanks!!!! Just wanted to show you what he has to wear everyday for the next 10 weeks.... usually padded with washcloths....this is what it looks like without them. I know this is horrible....but what people do to animals is horrible. Please continue to donate...we are close , but really need your help....go to www.huskyhaven.org and give your $20.00 and a new name for this boy.....please help!!! More news and a great adoption!!!! So just want to thank all of you that have helped our poor little boy. He is finally eating enough to keep up his strength....and is so happy. I know he is still hurting.....but he never complains. We are still short $700.00 to $800.00 , so please keep sending in those unique names and donations!!! We will be sending out tee shirts to those of you that have donated and I will send one of these bracelets to the winner of our name contest!!! Animal Abuse Awareness bracelets.... amethyst, crystals, silver and pewter!!! This morning....waiting for a tummy rub!!!! 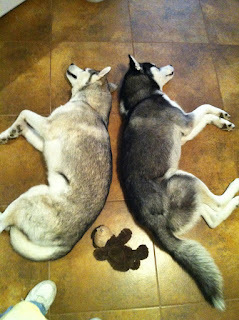 Please keep those donations coming in at our PayPal at www.huskyhaven.org.........thanks so much!!!! So yesterday we had an adoption that just started out as a change of fosters for the week. Babs was a baby we rescued from animal control.......a Husky mix. She had been with her foster Mom for about four months and we had no one interested in her......considering she was a pup that was a surprise. I had set up a photo shoot with a local magazine for Tuesday, and her foster Mom was going to bring her to my house for the week so we could get her pic. Meanwhile our director was working with a couple to possibly get Babs adopted. The timing couldn't have been better...the family and foster Mom showed up at my house at the same time. Babs was in the backyard and I already knew that our potential new Mom loved her. Had to run it through the their child , Dad and Brandi.....I was hoping she would be her new BFF. One of the criteria for adoption was that she would play ball with their son.......she was so distracted by all the attention at my house that she just never did........I was hoping they would give her a try though!! In the end she went home with all of them and played ball that night with her son!!! She got along great with their dog too!!! Babs , I mean Lily and her new friend Brandi!!! I always love the happy endings......our little girl is now Lily and I hope she'll be catching ball for many years!!!! We have a bunch of wonderful, loving dogs looking for a new home , too........please go to www.huskyhaven.org and check it out........and keep those donations for our boy coming.....Thanks!!! An Update.....and then there were none!!!! Just let me say....you guys are wonderful!!!! We've already gotten a bunch of donations....but, sadly we still need more. To those of you that have donated....thanks from the bottom of my heart. I cried a bit today when I saw how many great people came through for us!!! I also love all the name suggestions...and I think I get to pick!! I will send the winner one of my animal abuse awareness bracelets....you can check them out on my Etsy store lovelylizzys. A few pics from the last couple of days. He got a little break from the cone!!! He went to the doc yesterday....they say he is progressing well. Still a long road for this boy!!! Took his last antibiotic today and the pain patch they had on him is off. He still has weeks of crate to look forward to....but hopefully a great outcome. He never whines or complains......there is a special place in hell for the person that hurt him. 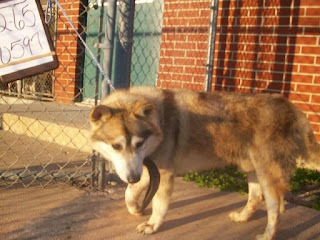 Please consider donating $20.00 and sending a name for him at www.huskyhaven.org the contest still continues!!! This boy was picked up by animal control last week.......just left on the side of the road. 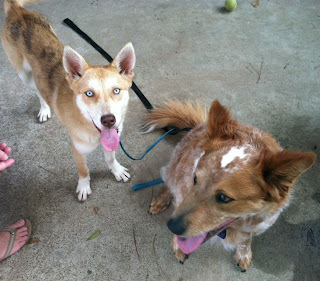 When they got him they immediately called Husky Haven to see if we could help. Both bones in his front right leg were broken and he had a tooth missing. We rescued him and got him to the vet and started antibiotics and pain meds to help him. The choice: amputation or surgery for his leg. The decision: surgery. He had to have a pin put through his leg to stabilize the two bones and his mouth was stitched up. The cost: $2000.00. You might ask why.......just look in his eyes. The hardest thing to stomach through this was the fact that someone kicked him or hit him with something. We originally thought he had been hit by a car.........the vet found no abrasions or bruising......just the localized breaks. 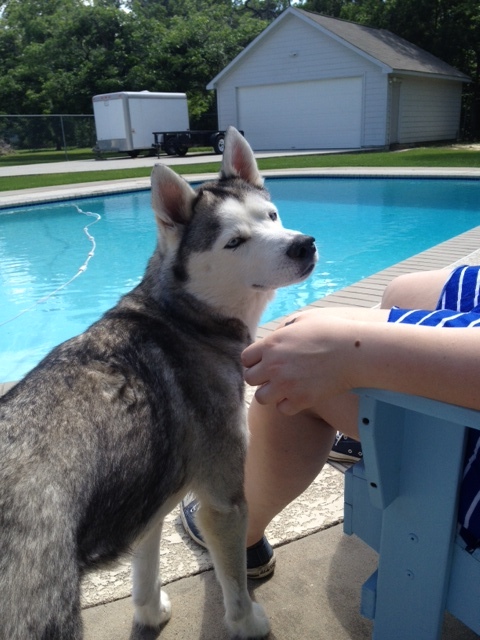 This guy is a forty pound mini Husky........someone really wanted to hurt him. I know these pics are hard to look at.......imagine having to take care of him everyday. He will have to be crated for the next three months in order to help him.....I will probably take him in for some of that time .....it's a daunting task. Right now he has a Fentanyl patch around him to keep the pain from getting too much. 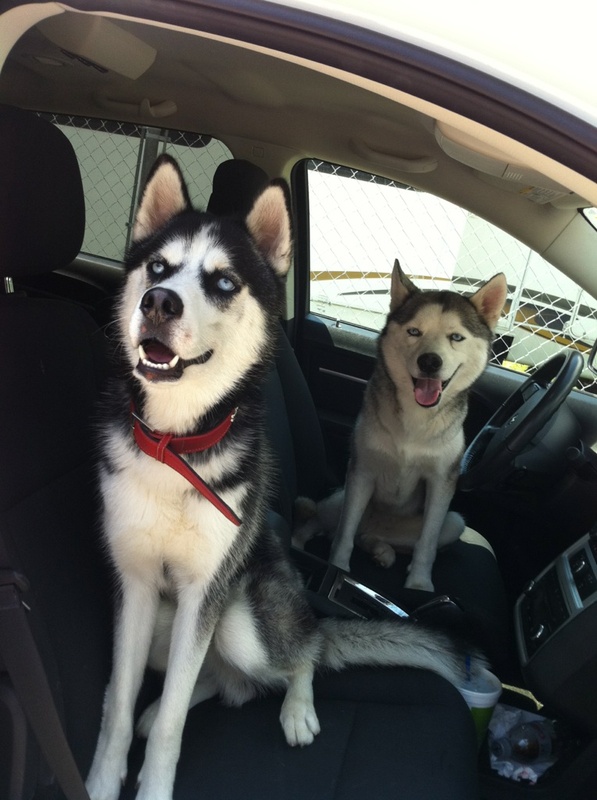 Going for a ride with my bro, Koda!!!! Really....they didn't pose us this way!!! Getting ready for a swim!!!!! Tomorrow I'm going to be setting up a contest to help name our new kid. I know it's been posted, but Husky Haven rescued a poor baby with both bones broken in one leg. He had surgery yesterday and was picked up this afternoon.....without surgery his leg would have to have been amputated. He is now on antibiotics and pain meds and under our directors watchful eye.